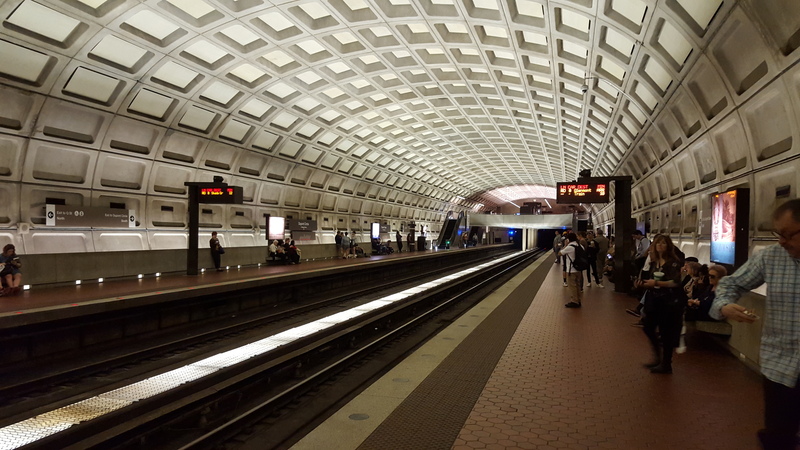 Metro station in DC. Photo: Blogger’s own. You never know what you’ll stumble across in Washington, DC. That’s its charm. 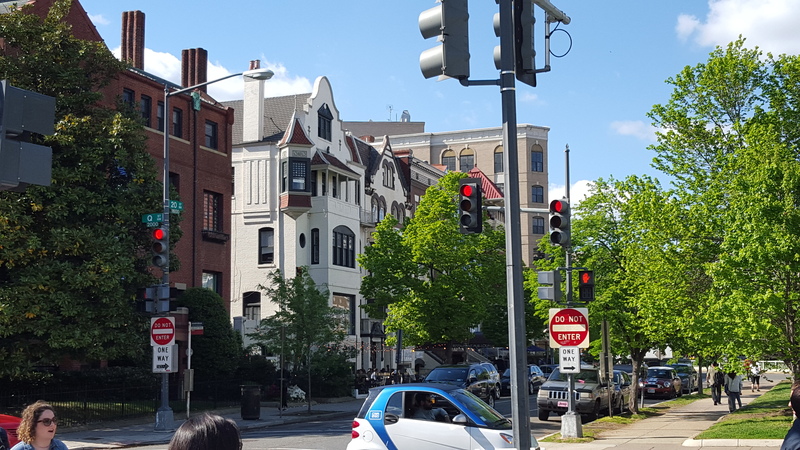 I’d heard that one of my all-time favorite Renoir paintings had its home in DC, so I promised myself that I would go and visit when the weather improved. The painting lives in the Phillips Collection, an art museum that consists of three buildings. One building is the boyhood home of Duncan Phillips, while the other two buildings are additions to it. It was fantastic to actually see Renoir’s Luncheon of the Boating Party for myself. Up close, you see the genius of the man. I’m amazed at how he got the glassware to look so real and the people so lifelike. This painting depicts Renoir (at far left), his future wife Aline (with dog) and other friends of Renoir. 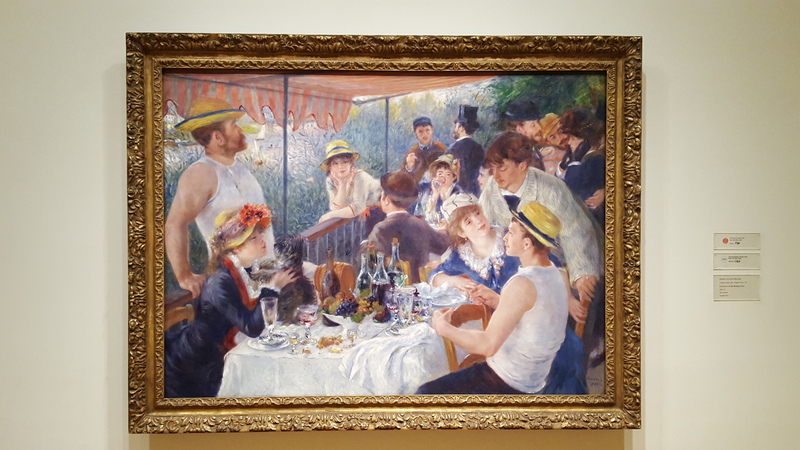 I chatted with other art lovers while viewing the painting; we speculated if Renoir and his friends had walked up from the riverbank or if this was a restaurant or the deck of someone’s house. Renoir’s “Luncheon of the Boating Party.” Photo: Blogger’s own. 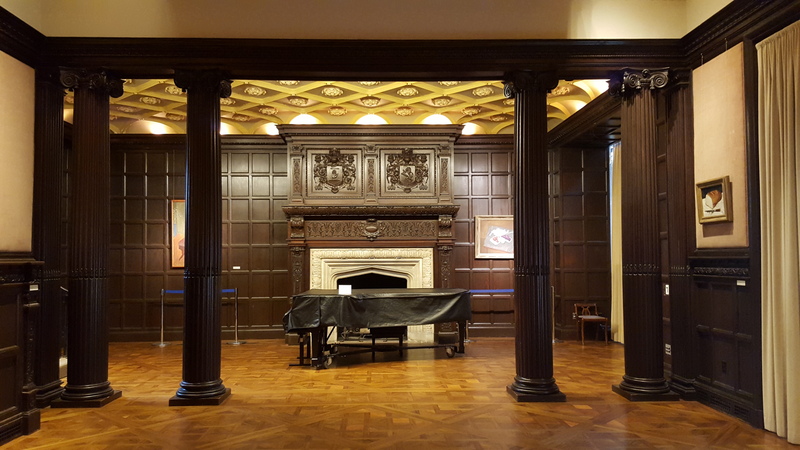 Music room at the Phillips. Oh, baby, would I LOVE to attend a concert here. Bet the acoustics are wonderful. Photo: Blogger’s own. 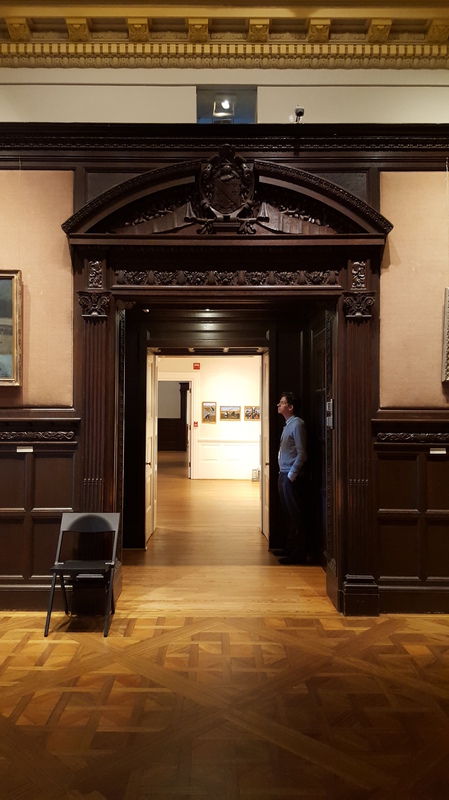 Another view of the music room, featuring a very patient Phillips docent in the doorway. Photo: Blogger’s own. After the Phillips, I felt hungry so I went to a nearby Mexican restaurant called Mission (1606 20th Street, NW). I had fajitas (yum yum) and the two guys sitting next to me had the most enormous plate of nachos I’ve ever seen in my life. The dish had to be at least four inches high with food. I was tempted to get the nachos but there was no way I could have eaten all of that. The exterior of Mission (the white building). Love that architecture. Photo: Blogger’s own. Surprise — a book fair! The wind whipped the sign back and forth, so it was hard to get a good photo. Photo: Blogger’s own. Very appropriate day to have a book fair, since last Saturday was also Shakespeare’s birthday. 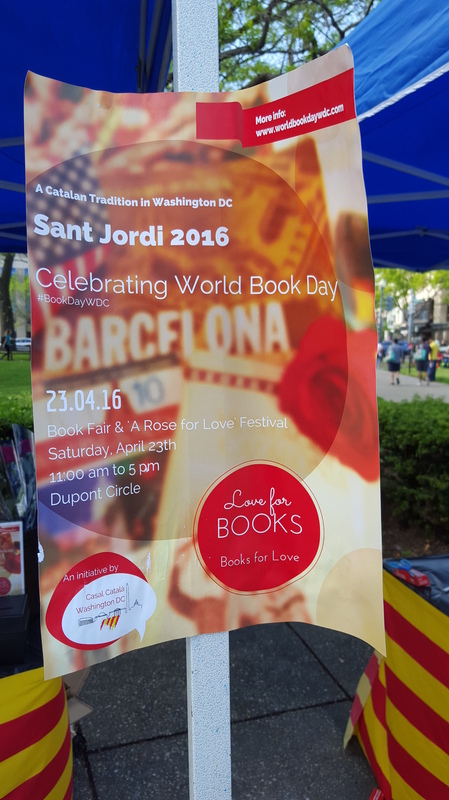 I wandered around investigating some books (mostly in Spanish) and chatting with vendors. Vendor tents at the book fair. I don’t know if the man in the suit to the right of the speaker was dancing the cha-cha, the merengue or something else, but he was having a fine old time. 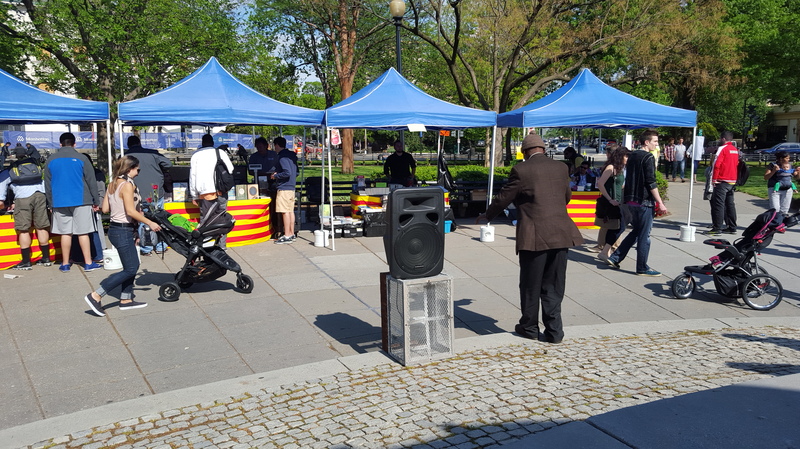 On a gorgeous spring day in DC, why not dance to celebrate it? Photo: Blogger’s own. Above the entrance to the Dupont Circle Metro, I discovered that someone had carved a quote by Walt Whitman. I’m thinking it refers to the time Walt Whitman spent in DC, bringing comfort to wounded soldiers. 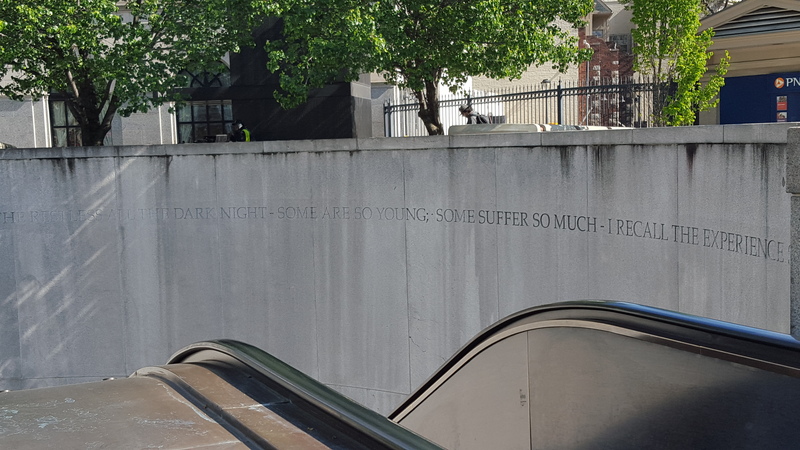 Walt Whitman quote above Dupont Circle metro station. Photo: Blogger’s own.